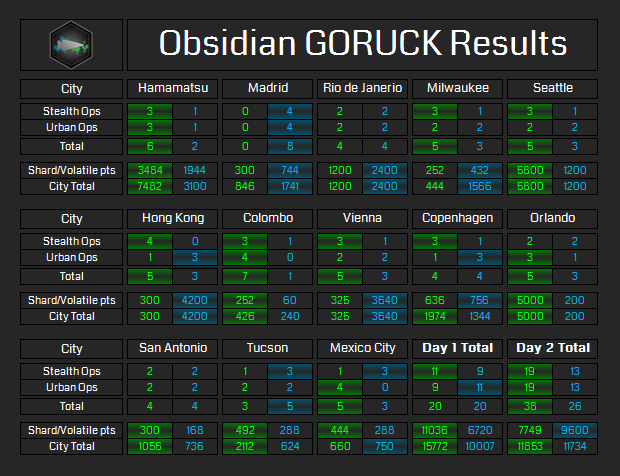 Obsidian GORUCK Results brought to you by the talented +Jordon Mizzi! The Obsidian anomaly series was the first one to have a GORUCK event at every single anomaly site. There was an overnight 12-hour Stealth Ops and during the anomaly a 5-hour Urban Ops at all 13 cities. The faction that won certain challenges in each Operation was given a QR code that linked to critical Volatile Portal or Shard target information. But just how well did each faction make use of this intel? Scoring was obtained from GORUCK cadre and staff members on the ground at each location. Scoring excludes Ultra Strike competitions. For the Enlightened, in Hamamatsu, Seattle, Colombo and Orlando, and for the Resistance in Madrid -- the teams that won the majority of the challenges also won the anomaly in the respective city by a significant margin. However, it was a different story in Milwaukee, Hong Kong, Vienna and Tucson where the winner of the majority of the GORUCK Challenges didn't seem to be put the intel to good use as the team that won GORUCK lost those cities. In Rio de Janeiro and San Antonio, the teams were tied with challenges won yet the city's scores were far from it. In Rio, the Resistance won with two thirds of all shards and in San Antonio, the Enlightened won by 320 points. The strongest battle ground appears to have been in Mexico city where the Enlightened won 5 out 8 of the GORUCK challenges and a majority of the Volatile Portal points but the Resistance still came out on top there by 110 points. By the end of Day 1 of Obsidian, both teams had won 20 challenges each yet the Enlightened won 4,316 more points in the Shards and Volatile Portals. 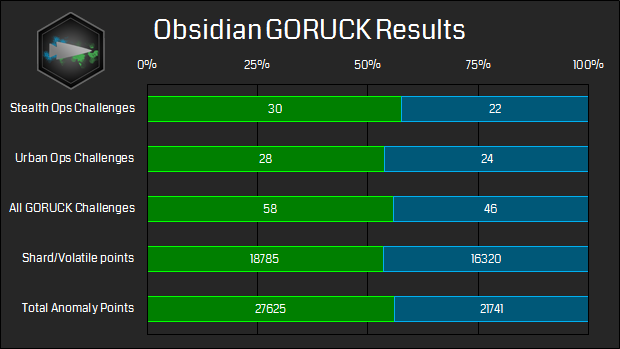 On Day 2, the Enlightened came out in front in GORUCK challenges winning 38 out of 64 challenges but the Resistance managed to earn more Shard/Volatile points by 1,851. All up, the Shard and Volatile Portal points made up 68% of the Enlightened's total score and 75% of the Resistance's total score. The Enlightened won 56% of the GORUCK Challenges, 54% of the total Shard/Volatile points and 56% of the total series points. 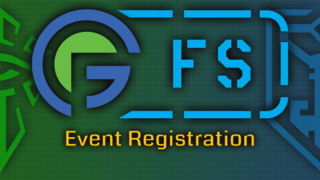 We'll be back on the 28th of May Live Blogging the Aegis Nova anomaly series, see you then!